Here is a set of two videos discussing Dr. Philip Young's theory of Facial beauty called Circles of Prominence. I stumbled upon these videos because I had heard Tony Robbins mention something about facial beauty being directly related to the size of our iris. I did a little digging and found the plastic surgeon who told him this, or at least I think this is the guy. Anyhow it's an interesting theory. Basically using eye scanning technology they determined that when we look at a human face, we spend a disproportionate amount of time looking at the eyes and the nose. Dr. Young theorized in his paper Circles of Prominence that ideal facial beauty occurs when the features on the human face are integer multiples of the iris. The interesting thing about this is that this standard of beauty scales well with various races. Since the basis is the size of your iris it's an interesting theory. The particular trait that I first heard of was the idea that if your iris is exactly (literally) the same size as the distance between the bottom of your nose and your upper lip, then this was considered by your brain as more beautiful than if it was 1mm off. He talks about some of the history of the theory of beauty as well in the video. I must say I am interested in seeing what pops up in the future relating to this theory. 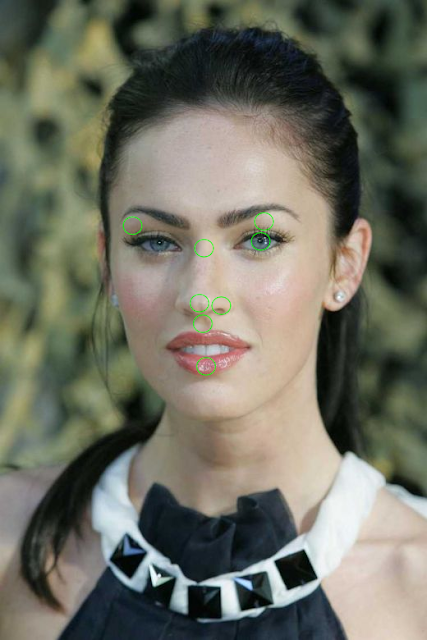 I decided to test this out using Megan Fox to see how she would fare.